Before you start, you should turn off all the electrical appliances and other electrical items in your home, including your lights and possibly even your boiler, as you have a blown fuse because you are either overloading your sockets, or because an electrical item is broken. Please see the video below for advice on how to avoid overloading electrical sockets. If you do not turn everything off before you start repairing the fuse, the fuse may break immediately after you turn your electricity supply on again. Turn the main fuse box off. You can usually do so by turning the main power switch to the ‘off’ position. Open the cover that protects the fuse carriers, or remove this cover. Take out the fuse carriers and inspect them to determine which one is the broken fuse. You may be able to tell which fuse you need to replace by the presence of scorch marks, or the fuse may be visibly broken. If the blown fuse has affected a whole power circuit, then turn off and unplug every appliance that uses the circuit. For lighting circuits, simply turn off the light switches. Doing so means that when you fix the circuit and turn the main switch back on, the fuse will not immediately blow again. Remove the broken fuse wire and replace the fuse wire. If you want to know how to change fuse wire, then look no further. We’ve got all the information you need! Buy a fuse wire that meets the correct amp rating. Loosen the terminal screws and remove the old and broken wire. Cut the new fuse wire so that it is long enough to wrap around both terminal screws and cross the fuse carrier. In a clockwise direction, wind the wire around one terminal screw. Tighten this terminal screw into place. Tighten the final terminal screw and replace the fuse carrier. Close the cover and turn the main switch on again. The circuit should now be repaired. Buy a cartridge fuse tester so you can check which cartridge is broken. Turn off the main fuse in the fuse box. Gently remove one of the cartridges. There may be a screw in the cartridge carriers that you have to remove. Test the fuse in the cartridge fuse tester. If the fuse works, put it back in the cartridge, put the cartridge back in the fuse box, and check the next cartridge. When you have discovered which fuse has blown, replace this with a new fuse. Ensure the new fuse has the same amp rating as the fuse carrier requires. Turn the main switch back on. 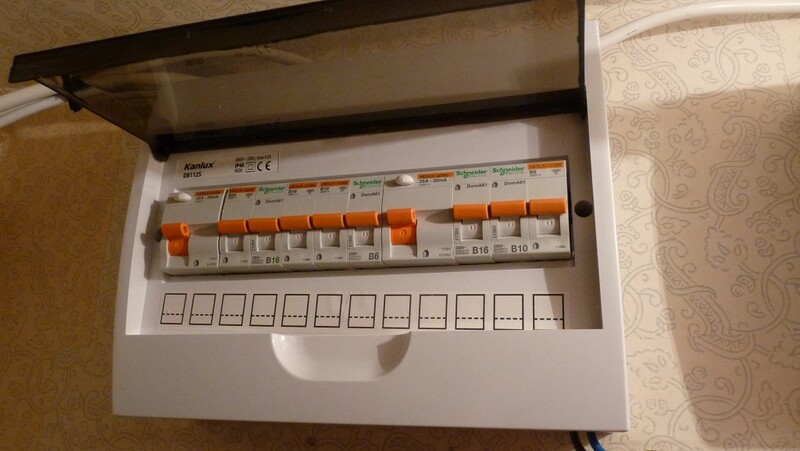 Circuit breakers are far easier to fix than old-fashioned fuseboxes. It should be very obvious what fuse has tripped in a fuse box, as the switch will be in a different position to all of the other switches or will have popped out. Turn off all the appliances on the effected circuit. Switch the miniature circuit breaker on. Look at all the items on the circuit to ensure that they are working properly. Check for signs of appliance breakdowns or damage to lights and fittings. Do not plug in anything you suspect may be damaged, as the fuse will blow again; if you have electrical appliance cover, you can contact 247 Home Rescue to repair or replace the broken appliance. Ensure you are not overloading any sockets, such as by overloading extension cords. If you are unsure which appliance has broken, then unfortunately you may have to sacrifice a fuse to find out. Turn on your items individually until the fuse blows again. The item you switched on immediately before the fuse blew is the source of the problem.